This is a great side dish for Chinese.It is pretty simply and I kind of just threw things together! 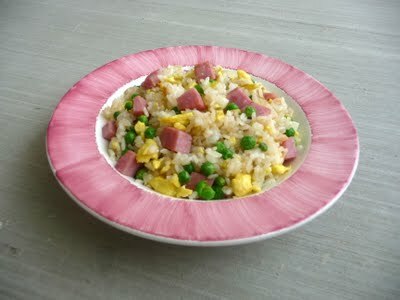 Here’s the recipe:HAM FRIED RICE2 Tbsp. oil2 cups chopped green onion2 cups cooked rice, cold2 eggs, scrambled1 Tbsp. soy sauce1/2 tsp salt1/2 cup diced ham1/2 peasHeat pan, add oil and fry onions until brown. Add cold rice and saute. Add scrambled eggs, stir. Add soy sauce, salt, peas, and ham. Saute until done. Serve hot.Enjoy! I love fried rice but I can never get it to taste good. I'll give this a try! This looks so filling & good! Yum! My Korean Grandma used to make a nearly identical fried rice, only she used bacon....was SO good with a big dollop of korean chii paste. I think I know what I'm having for dinner tonight! Delicious plate of fried rice! We love fried rice, comfort food anytime of the day, easy, quick and delicious too! I could eat a big plate of your delicious looking fried rice! This would be a hit in my house! I am going to try this this week. Thanks for stopping by my blog! Following you back and here's to reading more great recipe posts! Nice job and great blog work!!Thanks! Looks good as long as I can use turkey ham. I don't eat red meat. Hey lady! Thanks for following at Lighten Up! This ham friend rice looks amazing - must make!I Liked you on FB, but I don't see the Follow thingie in your bar. I will be back to follow, though, as soon as GFC is up again. BTW, have you tried removing and re-adding your followers gadget? Sometimes that works for me! I'll be back! Oh that looks so good! Thanks for stopping by my blog and following me. What a cute blog design you have, I love the green! I look forward to seeing what recipes you put up next. http://talesfrommyjournal.blogspot.com I can be found in facebook too http://www.facebook.com/DeniseMartin.LillaRose and twitter @DeniseLillaRose If you like/follow me there I will do the same for you. yummy! fried rice, however simple, always hits a spot for me! !